Saturday's going to be a big day round these parts with over sixteen wonderful bloggers bringing their best (or worst!) retro offerings to our bloggy 'table'. Donna and I can't wait to see what's for breakfast, lunch, or dinner...we think it's going to be an interesting spread to say the least, and while we can't guarantee you're going to get through the morning without gagging(! 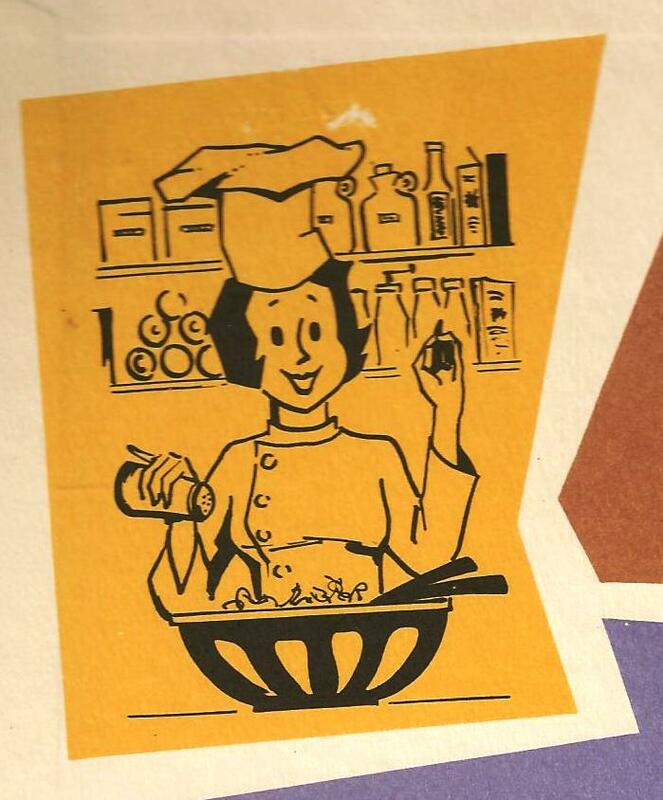 ), we do know you're in for a wonderful culinary trip down memory lane. I hope that's not Fanny's finger Johnnie's sucking?! or share a favourite recipe from your childhood...something you loved that your Mum, Dad or Grandparents used to whip up, that'd be great too! IT'S NOT TOO LATE!!! we'd love you to join us. For more info, just click the not-so-pretty pic you can see in the top-left hand corner. Or drop us a note in the comments. and don't worry too much if you can't make it for lunch AEDT, stragglers* most welcome. image from The Golden Homes Book of Kitchens and Living rooms, 1972. And now, here's the ugliest t.t. I've had the misfortune to find. So ugly, it had to come home with me! I hope it's not a precursor of things to come on Saturday. * Straggler: a person who strays or falls behind. How is that rangehood. I bet it was efficient and that it doesn't rattle and vibrate like the one we have. I have to fess up, I actually like that tea towel. Not sure if I should admit to it but I would have bought it in a flash. I'm all done, retro foodie up and ready to post :) love the range hood too! 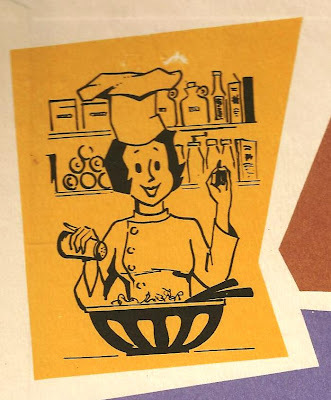 Oh I am so looking forward to the retro culinary delights! 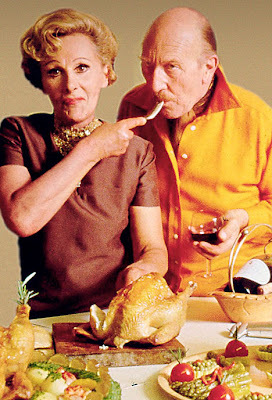 Fanny Craddock was quite a madam, there was an excellent BBC TV drama made about her career called Fear of Fanny, with the wonderful Julia Davies playing her. 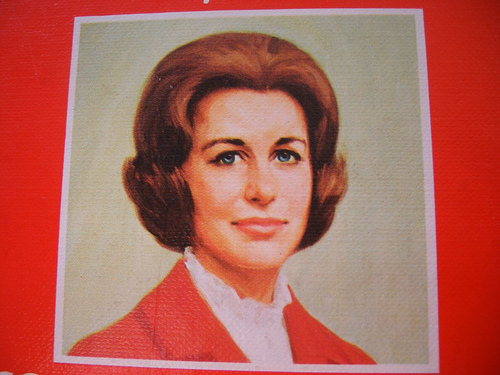 And I expect it's apocryphal, but there's a story that in one cookery show, Johnnie sampled her baking and commented "mmm, I hope all your doughnuts taste just like Fanny's!" If it isn't true, it ought to be! Not your usual style of t-t, Kylie, but a reminder to eat more fish, perhaps? Looking forward to it (and that teatowel is foul). Yesterday I looked at my recipe for the cookoff, and the picture triggered my gag reflex just a little. I can't imagine what the real dish is going to do. I had the same reaction to that tt as I have to blankets with pictures of wolves on them and sofas with wagon wheels for arms and embossed horses heads on the vinyl. Fanny and Johnny Cradock lived just down the road from where we now live - surprisingly, quite a modest house - it was for sale not so long ago, and took an age to actually sell. Creepy couple indeed - very strange lady. Often when we drive past the crematorium where she was 'laid to rest' hubby will mention that weird old bird. Sad end, she had. I just figured out the time difference between AEDT and CDT. I'll have to have my post ready by 8 p.m. on Friday here, at the latest. I'd better get crackin'. I work with Singapore. They get to work at my 4pm. Something like that. This is going to be quite an event. Technicolor food, the stuff you imagined eating in the future when you were a kid. The antithesis of 'rustic'. Grotesque tea towel. My mother's neighbour Rita frightened me off bird stuff when I was young. Told me bird related homeware brings misfortune. Burn it, Kylie! Only now remembered I haven't replied to your email. How very rude! I love the idea of a parcel sailing my way. I hope it comes before Christmas, but there's something very special about unwrapping things after the big day! Looking forward to it Kylie. I have added another dish by request from Carl, it's not my favourite recipe so I hope he eats it all! Oh, I have an idea of something I could make... It is from my mom's recipe box when I was 13. Very decade appropriate. Dana is right. We will have to finish and post Friday night. My husband and son will be de-lighted it. Hi there! The link on the cook off pic doesn't go anywhere (for me) but let this comment suffice. 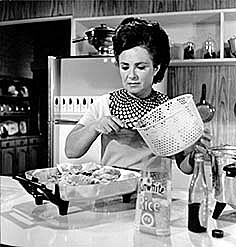 Will post a recipe, pics and your links on Friday... just for fun (and I hate to cook on Friday). i've found a recipe and though it's tame by 'vomit-loaf' standards i'm pretty sure i can gross out my family with it! I'm definitely getting my ingredients tomorrow! Not sure what the time difference is but I will be there at some point. I've decided on 'Cod in custard sauce' from 'The Complete Hostess' (50s book). Apparently it's for breakfast! 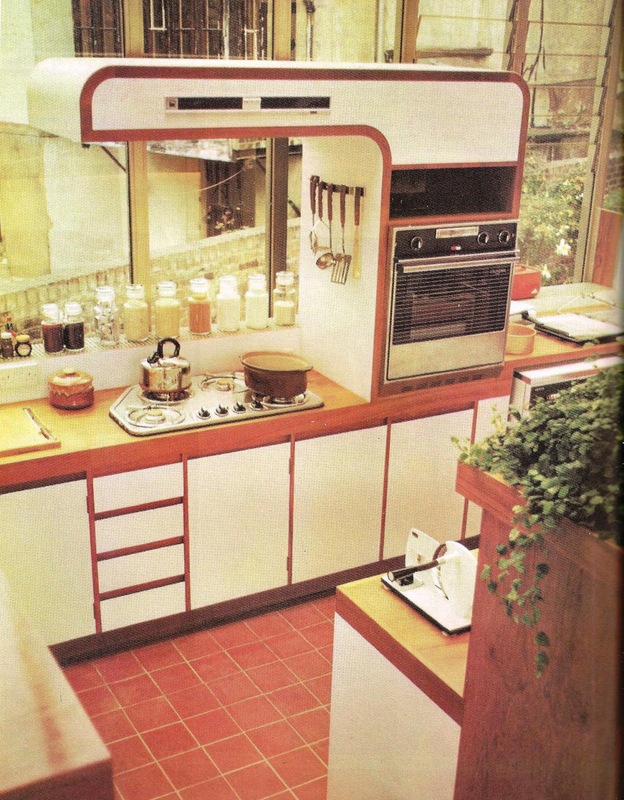 that 1972 image from your Golden Homes Book of Kitchens thrills me! i'd be forever looking out that window too!